The $1,000 grants were awarded to 25 students across the nation. “We are pleased to help open doors to expanded global knowledge and meaningful engagement with different cultures through our study abroad grants," said Society Executive Director Dr. Mary Todd. The Honor Society of Phi Kappa Phi, the nation’s oldest and most selective all-discipline collegiate honor society, today announced the Session B recipients of a 2018 Phi Kappa Phi Study Abroad Grant. The $1,000 grants were awarded to 25 students across the nation. The grants are designed to support undergraduates, both members and nonmembers from campuses that have Phi Kappa Phi chapters, as they seek expanded knowledge and experience in their academic fields by studying abroad. The selection process for a study abroad grant is based on the applicant’s academic achievement, campus and community service, relation of travel to academic preparation and career goals, a personal statement, letters of recommendation and acceptance into a study abroad program. Established in 2001, the Study Abroad Grant Program has awarded more than $800,000 to undergraduate students. The grants are part of the Society’s robust portfolio of award programs, which give nearly $1 million each year to outstanding students and members through graduate and dissertation fellowships, funding for post-baccalaureate development, and grants for local, national and international literacy initiatives. For the complete list of recipients from Session B of the program, please visit http://www.phikappaphi.org/studyabroad. The application process for 2019 will open on December 15, 2018. 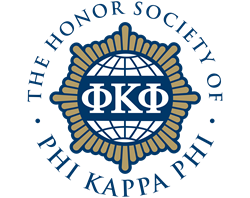 Founded in 1897, Phi Kappa Phi is the nation's oldest and most selective collegiate honor society for all academic disciplines. Phi Kappa Phi inducts approximately 30,000 students, faculty, professional staff and alumni annually. The Society has chapters on more than 300 select colleges and universities in North America and the Philippines. Membership is by invitation only to the top 10 percent of seniors and graduate students and 7.5 percent of juniors. Faculty, professional staff and alumni who have achieved scholarly distinction also qualify. The Society's mission is "To recognize and promote academic excellence in all fields of higher education and to engage the community of scholars in service to others." For more information, visit http://www.phikappaphi.org.